The Danish-brothers Lasse and Anders Bøgemark has struck a vein of metal-gold again with their second outing “Ghost Town”. These workaholic boys formed the quartet LUCER, and after the surprise-storming hit album “Bring Me Good News” from 2016, they have been kept busy becoming one of the most electric stage shows in Europe. From winning fans inside their home of Copenhagen as well as outside the future looks bright and the strength of “Ghost Town” does point to a more international appeal is on the cards. From the opening track: “Indestructable”, it is clear that this band refuse to disappoint, delivering a sound which is both sonic and relatable. A hark back to the industrial sounds of the eighties with heavy sprinkles of RUSH, combined, these elements make this an incredibly infectious and highly accessible offering. The vocals of Lasse are extremely delicate, at times the passion he projects is both an impressive and emotional experience. The title track “Ghost Town”, is a retelling of modern day life, an almost reggae feel to the beat, perhaps if THE POLICE went in a progressive direction this is what that joyful thought would bring. As the album continues with the mix of electronic and raw soundscapes forging beautifully the anthemic “Crazy”, an even balance of the serious and the tongue-in-cheek themes, rock-star fame and the reality of hero-worship. “The Night The Music Died” is a highlight, again the themes of the music-industry and the realization of what is at its core collide to bring one of the best retellings of the twenty-first century struggle to succeed. Indeed this theme runs through the album, not conceptual fully but they are writing of experience and creating a fine body of work around it. Continuing with “Party Like A Rock Star”, a slight feel of the incendiary best from the ARCTIC MONKEYS, though the edge of LUCER guides the band away from any deep commercial aspects. The acoustic nineties-Britpop of “Killer”, does open other dimensions to the sound of LUCER, the voice of Lasse Bøgemark is displayed in as the raw, emotive force it is against a subtle acoustic guitar before the rest of the band explode into the chorus. 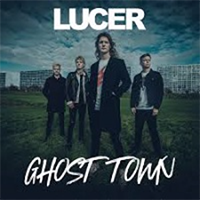 This is a deadly album, the fact they highlight the disasters of the music business as the themes may is besides the point, LUCER deliver every strand of this album flawlessly. Then there is the production, that extra instrument to fuse the vision of the brothers Bøgemark, it makes “Ghost Town” the true sound of the direction that power-rock and progressive-rock can take without leaning on all that came before. Lovers of music, not just those who like thundering metal will find something in this genre-crossing watermark.